"Riding is the only thing a King learns how to do right, since a horse is no courtier and will just as soon throw a Prince as a stable boy." Horses, both in fiction and Real Life, are living creatures, and come with their own personalities. They lose their tempers, they get scared, they react like you'd expect an animal to react. Often suspiciously like you would expect a dog to react. Sapient Steeds are liable to be this if you treat them badly... or possibly just because, like humans, they have a mischievous streak. And lord help you if you have a Moody Mount. Aversion of Automaton Horses, and in the case of wild horses of All Animals Are Domesticated. Also an aversion of horses' usual Animal Stereotype of being noble, loyal and steadfast. Not to be confused with Horsin' Around. Ponyta and Rapidash from Pokémon are both described as being wild-natured and burning anyone whom they don't trust if said person attempts to ride them. In one early episode, Ash Ketchum has to train a Ponyta for a race after its own trainer is injured and has a very hard time of it. About halfway through, though, things get better and Ash gains the trust of the Ponyta, which goes on to win the race - after evolving into Rapidash. Jolly Jumper, the horse of Lucky Luke, is a textbook example. Besides being able to run impossibly fast and long, even while sleeping, and always coming when Lucky Luke whistles, as the series develops he gets the ability to speak and play Chess with Lucky Luke. Oh, and don't think of stealing him. It will get really painful when he recognises that you are not his rider. Wonder Woman (1987): Pegasus gets to return to the mortal coil when Medusa is beheaded for a second time, and immediately shows that she's got a strong opinions on whom she likes when she kicks the remaining two gorgons hard enough to knock them out and takes a warning nip at Ares. Wondy, who can understand animals to an extent helpfully tells an amused Ares that Pegasus doesn't like him. Celestia does this to Navarone in Diaries of a Madman, after he invades one of her dreams. Since dream logic is in effect, it also results in him being Squashed Flat. Disney in general seems in love with this trope. Horses acting up are, of course, a good way of getting laughs out of parents and children alike. And since many Disney employees during the golden age were avid riders (the Disney Studios fielded two polo teams) they had a lot of experience to work with. The scene in the Pecos Bill segment of Disney's Melody Time where Slue-Foot Sue tries to ride Pecos' horse Widowmaker. Watch it here, starting at 4:00 . It helps that his eyes are visibly red with anger during this scene. The Prince's horse in Sleeping Beauty, who until the climactic scene was very stubborn and had to be bribed by carrots to do his master's bidding, and even then the horse bungles it and charges straight into a puddle. Phoebus' horse from The Hunchback of Notre Dame when he was told to "sit". His face seemed well smug. Self-satisfied maybe? Maximus from Disney's Tangled pulls this when Flynn tries to ride him near the start of the movie. In Spirit: Stallion of the Cimarron has an entire sequence where soldiers attempt to "break" the resistant Title Character. Fittingly enough, the background music is "Get off of my Back. " Later in the movie, Spirit is just as resistant and rebellious to a kinder Native American, but eventually warms up to him. Horsey people in general tend to have a Misaimed Fandom towards Spirit considering he's unrideable. A rock steed tries but fails to wrestle Berix off its back in BIONICLE — The Legend Reborn, even though it's technically a biped dinosaur that wouldn't be anatomically capable of doing this. But the movie insisted on treating it as a horse. When the title character of Auntie Mame marries a southern oilman, and pretends to know more than she does about horsemanship and fox hunting, his family tries to sabotage the marriage by getting her to ride a bucking brute named Meditation. She survives in a slapstick way. The Legend of Frenchie King: Maria tries to sell Louise a very wild horse of hers. Much to Maria's surprise and displeasure, Louise ends up gaining control of it after some rodeo-like stunts. In The Mask of Zorro Alejandro tries to summon his horse, Tornado, with a whistle, so he can jump out of a window onto its back. The horse comes at the whistle, but is having none of this "leaping onto his back" stuff, and steps aside, causing Alejandro to land with a painful set of Amusing Injuries. This is also a throwback to an earlier scene where the previous Zorro did it without a hitch. Seabiscuit in both the film and in real life. Also contains a scene where an unnamed horse bolts and nearly kills his rider when he is spooked by a backfiring tractor. The horse ridden by Chon Wang in Shanghai Noon has a mind of its own and rarely responds to his wishes unless it wants to. Sherlock Holmes in Sherlock Holmes: A Game of Shadows distrusts horses, describing them as "dangerous at both ends and crafty in the middle"note an Ian Fleming quote and complaining that they have minds of their own. The horses we actually see turn out to be more typical fantasy motorbikes. In Teenage Mutant Ninja Turtles III, the Turtles try their hand at horseback riding. They are each in turn thrown off... except for Leonardo, who goes riding off standing on the horse. True Lies has a wonderful example when the police horse Arnie is using to chase a perp flat out refuses to jump a gap between skyscrapers. The Woman in Red: Teddy tries horseback riding with Charlotte. In Black Beauty, a horse revolts when the bearing reins are drawn too tight to bear. As the book is an Author Tract against cruelty to animals, the narrative's sympathy is entirely on the side of the horse, with the result that bearing reins soon fell out of favour except as safety equipment. In Dragon Bones the demise of Ward's father is brought about by his stallion. Ward is not particularly sad about this, rather relieved, as his father was a violent man, who beat him nearly to death more than once. Ward endeavours to tame the stallion, who he is convinced is only so fierce because of mistreatment. He is right, and acquires a Cool Horse. In The Elenium novels, Sir Sparhawk's horse Faran. Faran is infamous for his bad temper and a tendency to bite strangers (such that Sparhawk always has to warn handlers about it). In one of the later books, the child-goddess Aphrael tells Sparhawk that Faran only has a bad temper because he is trying to please Sparhawk by matching his personality. Much to Sparhawk's annoyance, Faran has a habit of prancing whenever Sparhawk rides him with his formal armour on. The horse is also remarked upon to be unusually intelligent, to the point of understanding Sparhawk's speech and having memorized the ritual entry into a Pandion Chapterhouse as well as Sparhawk has. The horses of the Tortall Universe have very distinct personalities in general, but special mention goes to Cloud (Daine's pony, and often a grumpy Team Mom as well) and Peachblossom, Kel's inappropriately named, bad-tempered gelding, who decides to be Kel's equine partner because she treated him well and because (as he tells Daine) she needs to be looked after. Several novels in the Heralds of Valdemar series include (usually humorous) antics from horses, such as the infamously ugly and ill-tempered Grey Stud in The Last Herald-Mage, a beautiful but stupid horse in Oathbreakers, and an entire stable full of misbehaving horses in the short story "Spring Plowing at Forst Reach" in Oathblood. Multiple Companions are described in passing as doing this as well, either due to disagreements with their Chosen or a taste for low humor. Companion Kalira once saved her Herald from a woman pulling a Wounded Gazelle Gambit, commenting "I wish I'd had something to leave on her shoes!" The horses in the Hank the Cowdog series are real jerks because, as Hank puts it, not only do they think they're better than everybody else, but they will go out of their way to try and prove it. Hank: If there's anything worse than pretense, it's reality. And anything that weighs 2000 pounds and bites and kicks and stomps must be considered reality. And that's just the usual ranch horses. Book Number Eight pits Hank against Tuerto, a "One-Eyed Killer Stud Horse" who breaks loose and terrorizes the ranch simply because...well...he can. The protagonist of the Garrett, P.I. novels dislikes horses, and claims they're sneaky bastards that invoke this trope on him deliberately every chance they get. The Chronicles of Narnia novel, A Horse And His Boy, has a Deadpan Snarker of a horse as a main character. Boris from Going Postal is a half-mad stallion who would have been a perfect race-horse if it weren't for his tendency to throw and trample the jockey, attack the other horses, then jump the fence at the first turn and bolt. Moist von Lipwig asked for a horse with "a bit of fizz, and not some feagued-up old screw", and Willie Hobson gave him Boris to ride. So what does Moist do? Raise the stakes by riding Boris bare-back from Ankh-Morpork to Sto Lat. note It is fair to say, however, that the Discworld Award For Bloody-Minded Riding Animal goes to camels. Every time. The horse belonging to the hapless Lieutenant Blouse in Night Watch is evidently from the same stable. According to Witches Abroad, Jason Ogg the Lancre blacksmith has the secret of the Horseman's Word used to quieten bloody-minded stallions. It involves a swift smack between the eyes to get the beast's attention, followed by the threat of the stallion finding his "goolies" between the anvil and a big hammer. Even the most fractious stallion calms down around Jason. Runaway Radish from the children's book of the same name is described as a good bad pony, because he teaches his riders to make sure they check their girths, latch his stall, close all gates, plug in the electric fence, tie tight knots... and hold on tight! In an anthology of horse stories, one about the Pacing White Mustang tells of the titular mustang being captured and brought to a corral, where the cowboys intended to tame him. Instead, the horse refused food and drink for five days, and lay down and died on the sixth. Lois McMaster Bujold's Mountains of Mourning: Inexperienced (space) navy officer plus fractious mare equals amusing examples of this trope. In Dashiell Hammett's Continental Op story "Corkscrew" (set in the Twilight of the Old West), the Op (a City Mouse and no rider) tries to get a horse from the locals, who decide to have some fun with him by putting him on a meek-looking but mean-acting horse. The Op sees through their joke, and Determinator that he is, lets himself get thrown hard several times, impressing one of the guys enough to admit that while the Op can't ride worth a damn, he's got plenty of guts— and he's got a horse that the Op might be able to stay on. I had the buckskin's confidence by this time. We were old friends. He didn't mind showing me his secret stuff. He did things no horse could possibly do. I landed in the same clump of brush that had got me once before and stayed where I landed. At least one canon Sherlock Holmes story involved this. In "Silver Blaze", it's revealed that the titular horse had killed the "murder" victim. However, since the victim had attempted to lame the horse via a surgical tool, and the horse was likely reacting to something the victim was doing in line with it, Holmes calls it a case of self-defense. Loras Tyrell, from A Song of Ice and Fire, manages to defeat the much larger, stronger, and more vicious Gregor Clegane in a joust by taking advantage of this. Clegane rode a young stallion, so Tyrell showed up on a mare in heat; the stallion proved much harder to control and keep a seat on than usual, so Clegane was unhorsed easily. In Saki's story "The Brogue", the title horse is a stubborn beast who rears at just about anything and everything. The family who owns him has been trying to sell him off for years, and finally does— to a man who's taken interest in one of their unmarried daughters. A certain amount of hilarity ensues. Patrick McManus wrote a few pieces about horses, mostly about how they're unpleasant critters that take delight in throwing their rider, don't obey, and tend to be stupid- you're much better off riding a nice, dependable mule instead. Of course, he only rides horses because his Clint Eastwood squint just doesn't look cool if you're on a mule. There was also the story about the time he was hanging around with his childhood friend, Crazy Eddie Muldoon, when Crazy Eddie was trying to lasso the family's horse (Old Joe in the original story, Lightning in the one-man play adaptation). Eddie's father came over to see what the boys were up to after having been fixing the barn's roof and wearing his safety rope. Just about that time, Crazy Eddie managed to lasso the horse, who unsurprisingly took off at a full gallop. Mr Muldoon: Eddie... where did you get that rope? Mister Ed: What do you expect? The show stars a talking horse! In Norse Mythology, Svaðilfari the stallion was assisting his unnamed master in building Valhalla within a certain time period in exchange for goddess Freyja, the sun, and the moon, but the Gods, having no intention to keep up their end of the bargain, made Loki (who allowed the use of Svaðilfari in the first place apparently just for the purposes of being a Troll) serve a distraction to keep it from being completed in the allotted time, and to accomplish this Loki turned himself into a mare in heat who trotted out and made Svaðilfari run off from his master, with the expected results. And that's how the 8-legged horse Sleipnir came into being. Lucy the pony from Non Sequitur is unusual in that as a talking horse she'll actually explain why she's acting spooky or headstrong. In Cactus Canyon, the player must shoot the Bronco Lane three times to tame the horse. "Guess the horse is breaking you then, heh heh heh!" Averted in The Legend of Zelda: Ocarina of Time. Epona is a trusted horse that follows the player any time she is summoned. However, unless you learned Epona's Song from Malon in the pre-Ganon Hyrule, Epona won't let you ride her. When you beat Ingo in a race with her, the rancher is utterly flummoxed that anyone could "tame that wild horse". In Red Dead Redemption, if you spur the horse you're riding too much, it will throw you. A disobedient pony is the only reason the protagonist of Lure of the Temptress gets involved in the plot. He's not a soldier, but his pony decides to charge after the king's horsemen as they head to battle. Then he's thrown from his saddle and gets captured, leaving him as one of the only survivors. The Legend of Zelda: Breath of the Wild will have horses fight against and disobey the player until the player fully trains them up. Even after that, horses with a "wild" temperament will still throw the player off if they try to dash too much. Taming horses in Minecraft amounts to getting thrown by them repeatedly until they get used to you (and sometimes one more time an instant after they do for good measure). Fortunately that deals no damage. Also, if you don't equip it with a saddle, you can't control it. A non-comedic example can be found in Gaia: Viviana, who is apparently not a skilled or bold rider, insists on riding a gentle but rather sorry looking nag named Casper because "He has never unseated me." Unfortunately, Casper proves that even the gentlest horse has his limits, dumping her and bolting when someone or something deliberately spooks him. Appa of Avatar: The Last Airbender. When a ten-ton bison decides something (entering a cave, leaving without backup, etc.) is a bad idea, it ain't happening. The Classic Disney Short How To Ride A Horse is built entirely on this trope. Note that Walt Disney (and a lot of his animators) were avid polo players. The show usually averts this when dragon cub Spike rides on Twilight Sparkle's back, justified in that they communicate verbally and Twilight's like family to Spike, but a parody of this trope shows up in "A Dog And Pony Show" when the Diamond Dogs are trying to grab onto the ponies, who in turn jump around and knock them off like very disobedient horses. A loose example that's played for laughs in "The Best Night Ever." Two pony stallions help to pull the ladies' carriage to Canterlot, and glare angrily at Spike when he gets too into his role as coach-dragon and whips them. A pony using another pony as a mount results at best in a miffed pony. Rainbow is less than happy with a shrunken Applejack rigging her with a crude bit and bridle for aerial assault in 'Bridle Gossip', and even Twilight lets out a miffed reply when Spike tries to have his 'noble steed' (read: her) charge in "A Dog and Pony Show". And 'Clover the Clever' (played by Twilight) is sullen about having 'Princess Platinum' (played by Rarity) ride her to avoid wading in a stream in the Hearth's Warming Eve pageant. Spike also gets thrown off by Applejack and Rainbow Dash during a rodeo in "Fall Weather Friends." One wonders how they talked him into participating in the first place. Twilight also flips Spike off her back for making a lame joke in "The Cutie Pox". Truth in Television since horses are still animals. Very big, powerful animals. Aside from the obvious danger of a kick or a nasty bite (which can be severe enough to disable or even kill), they can also spook or bolt if they're stung or startled, leaping or galloping off in a panic. When that happens getting dumped is almost inevitable. Worse, some horses have a nasty habit of lying down suddenly to roll in the grass... while you're still on them. The results can be fatal. So if your horse goes down suddenly... IMMEDIATELY get off the horse. Goes double if it's in the water. The riding accident that nearly cost Kaley Cuoco her foot is only one of many, many textbook examples of how dangerous horses can be without even trying. Imagine having one actually pissed off and hellbent on destroying you, which there are also numerous cases of. Horses can be sneaky devils as well. A common one is them inhaling as you fasten their saddles, so that when they exhale again, the saddle becomes loose and you end up riding upside down. They have lots of tricks beyond this, like getting the bit anywhere it's not supposed to be (between their teeth, beneath their tongue, back in their mouth, etc.) and flat out refusing to follow any of the rider's bidding. As an old refrain says, "Mas sabe el burro que quien lo monta" ("The donkey knows better than the person riding it"). That also goes for horses. And the worst part of all this? If a horse decides he isn't going anywhere, that horse isn't going anywhere. There is a reason why trained equestrians don't get in a tug-of-war with a horse - they have the experience to know they won't win. Horses are best managed with kindness and trust; failing that, they are managed by manipulation, followed shortly by bribery. When that fails, the rider in question calls in someone with more experience. 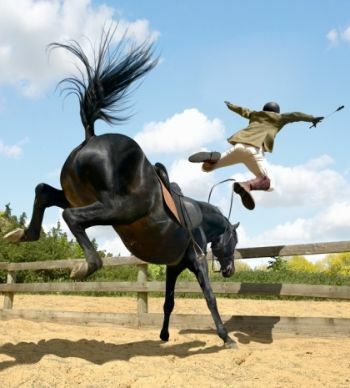 Horses will not jump anything unless they are a) in a blind panic or b) being ridden by a competent rider. There's an old saying that you can fool your enemies, fool your friends and even fool yourself, but you can't fool a horse, and if you don't know what you're doing you probably will make it past the first jump.... about ten feet past, depending upon terrain and atmospheric conditions. Many horses will also only jump something if they feel like it. Chronic escape artists have been known to jump 4'6" stall walls from a standstill without provocation (sometimes it seems just to prove the human wrong when they say "no way he could jump that!") and the best rider in the world can't make a horse they're riding jump even a small fence if the horse decides he's not doing it. An inversion to this: horses and other domestic/captive equines will go to all lengths to find a way out of their enclosures if they decide they really want out. They'll jump a fence that their keepers thought was too high like it's no problem and if it is too high, they'll wriggle their way out under the bottom. Build it low to the ground to stop them from doing this? They'll get another horse (usually a smaller one or a pony) to get under it and lift it up so that it's high enough for them to wriggle under. And that's if they don't dig a hole under it. Then there are ponies, who, in addition to all of the above, often have very talented lips, and easily master the art of unbolting their stalls. And occasionally every other stall in the barn as well, apparently for the lulz. Miniature ponies are particularly notorious for this sort of behavior, and it's said that the smaller a pony is the more intelligent they are, so if horses are troublemakers, ponies are Dennis the Menace. There's a common equestrian adage that goes something like "the higher the horse, the longer the fall; but the smaller the pony, the closer to hell". It's not unjustified. Donkeys the close relative of horses and ponies are well known for their stubborn nature and tend to be less trusting towards humans. Likewise, mules (a cross between a male donkey and a female horse) and the rarer hinnys (a cross between a female donkey and a male horse), who tend to inherit the stubborn streak of their donkey parents, hence the phrase "stubborn as a mule". However, once you get along with them, they are quite dependable, hardy, and intelligent, mules even more so then either parent. Ticking them off is not wise, either: they can strike with their hooves in any direction, even sideways. Camels are also known for behaving badly; they'll spit, bite, refuse to move, or run out of control for seemingly no reason. Balanced by the fact that in the desert you'd still rather have a live camel with you than a dead horse. Famous racehorse Seabiscuit's quirks were actually toned down for the movie, and he was a notorious bad actor until he was just lucky enough to get an owner, trainer and jockey who understood him. The race instructions "... never hit him with the whip, only touch him with it on the left side, and never more than three times..." were taken word for word from an interview with the real Red Pollard. Japanese racehorse Gold Ship is described as having "broken" several jockeys with his difficult personality. His racing career is littered with a mixture of astounding victories and inexplicably lazy races, thanks to the horse's moody nature. The anime Uma Musume adapted this difficult personality into a Cloud Cuckoo Lander with a habit of pulling pranks. There was an attempt to domesticate zebras during the colonial era due to them being immune to diseases that were decimating horses. They proved to be too prone to panicking and, being wild animals, were much more unpredictable than horses. A few people had succeeded after multiple cases of trial and error with a few individual zebras that could be ridden, but generally it was considered too much effort and the project was abandoned. This is also why, over the course of human history, zebras have never been successfully domesticated as a whole, with the only successes being in taming individuals, with any subsequent offspring inevitably being just as wild and aggressive toward humans as the offspring of non-tamed individuals. It's presumed that because they evolved alongside humans, their instinctive fear and aggression against humans has simply been too hardwired into their DNA to be overcome conventionally. David Niven recounted an amusing Horsing Around anecdote that happened to him while he was filming The Prisoner of Zenda in his memoir The Moon's A Balloon: The director wanted all of his stars mounted on fiery, flashy horses for the royal procession scene. Niven, being an experienced rider, wanted no part of that and bribed the wrangler to give him a nice, safe, gentle mare instead... only to be nearly killed when his nice, safe, gentle mare was mounted by Ronald Colman's stallion. According to Terry Jones, at one point in the First Crusade, a whole load of European knights (mounted on stallions for strength) encountered a whole load of Muslim cavalry (mounted on mares for speed)... during the season when the mares were in heat. Details of the subsequent engagement are lacking; the chroniclers of the First Crusade evidently decided this particular battle should be a forgotten moment. And of course, there is Christopher Reeve's accident as an example: he was competing at a horse trial when his horse Eastern Express suddenly slammed on the brakes one or two strides from a jump, something known as a "dirty stop" in equestrian circles. Reeves flew over his horse's head and struck the solid cross country obstacle head first; the impact approximated a fall from a three-story window. Reeves' head was saved by his helmet but the impact crushed the vertebrae in his neck. No one knows why the horse stopped, as he had never done anything like that before. He only had to do it once.